Model YZS-80 oil extraction press is main product that makes use of screw-driving force to squeeze oil from plant seeds. These oil extraction presses, after more than ten years' investment and modification, are concise in structure, easy to operate, and similar in performance to the advanced kinds of seed oil extraction press. This kind of seed oil extraction presses are better choice for pressing coconut,sunflower seed,jatropha seeds,palm,etc. The oil extraction press for cocount can match both electrical motor and diesel engine. This kind of oil extraction press and seed oil extraction includes the electrical heater and control cabinet. 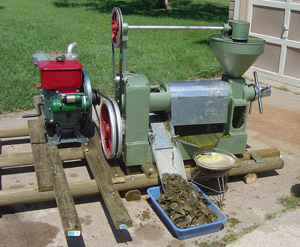 The function of the heater is to heat the machine before pressing the oil seeds. Usually, when press the oilseeds, the seed oil extraction press need be grinded first using raw material, in order to make the pressing temperature of chamber reach 80-120 degree. Then there is oil come out. If there is no heater, it takes about 30 minutes to make the temperature reach the appointed temperature. But this kind of oil extraction press only needs five minutes. Moreover, the heater is also helpful for increasing oil output. Especially for lower oil-bearing oilseeds, such as cotton seeds,sunflower seed,soybean. The control cabinet can be used for both motor and heater. The YZS-80 oil extraction press with diesel engine is also very popular in some areas. We are glad to match it if you need. This picture is also taken by our client. The model is YZS-80 oil extraction press. The product oil can be edible or also for making biodiesel as fuel. The byproduct oil cake/meal can be made for pellet as animal feedstuff, such as pig, chicken, cattle etc. Welcome to contact us in the follong form to get further info about our oil extraction press, we are always at your service! We are seed oil extraction,oil extraction press,coconut oil extraction professional manufacturer and supplier from China, with simple design and easy to operate, all execute ISO9001 and CE standard.